Kaffe ventured into the world of colourful yarn on a visit to a Scottish wool mill with fashion designer Bill Gibb. 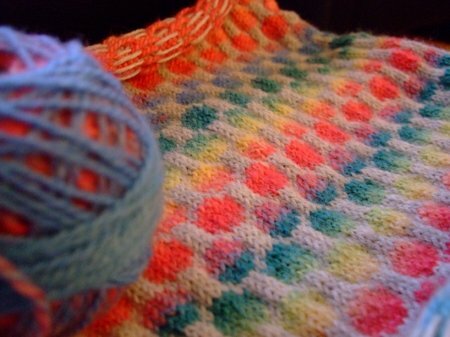 Inspired by the colours in the landscape, he was thrilled to find the same colours in yarns. He bought 20 colours of Shetland wool and some knitting needles, and on the train back to London a fellow passenger taught him how to knit. His first design appeared as a full page spread in Vogue Knitting magazine. Missoni and Bill Gibb commissioned Kaffe’s early commercial collections and his one-of-a-kind designs have been collected by Barbra Streisand, Lauren Bacall, John Schlesinger, Ali McGraw, Irene Worth, Shirley Maclaine, Helen Frankenthaler, Alan Bergman, and HRH Princess Michael of Kent. In 1985, Kaffe launched a needlepoint project on the TV programme Pebble Mill at One, inviting anyone across the country to needlepoint an image of their favourite thing, no bigger that 6 inches square, to form part of a tapestry. Over 2,600 entries were sent, forming the Pebble Mill at One Heritage Tapestry which was on show at Chatsworth House until recently, and now is at Harewood House. The same year, the British Crafts Council invited Kaffe to present a BBC daytime television series interviewing leading UK crafts people. Since then, Kaffe has inspired thousands of traditional one-colour knitters to employ rich palettes of colour through his six-part television series, Glorious Colour for Channel 4. The series was aired in 1986 in prime time, has since been repeated three times and was also available as a two-part video. It has been shown in various countries including Japan and Canada, which has shown it eight times on TVO. In 1998, Kaffe released Kaffe’s Colour Quest , a video looking at colour and design inspiration through his world-wide travels. In February 1999, Kaffe presented a six-part series for Radio 4 called A Stitch in Time. In 1988 the Victoria &Albert Museum, London, hosted a retrospective exhibition of Kaffe’s work, making him the first living textile artist to have a one-man show at the museum. The exhibition has since visited Finland, Holland, Norway, Denmark, Sweden, Australia, Canada, USA and Iceland. 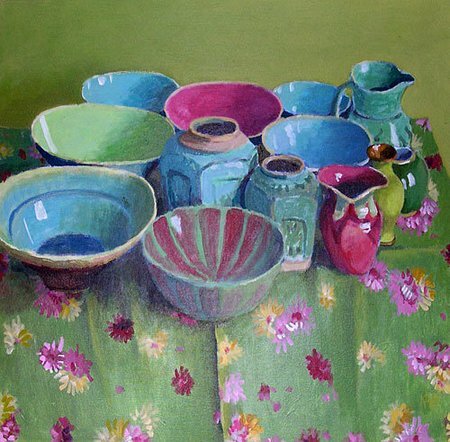 Recent exhibitions include the American Museum, Bath, UK; Sweden, Denmark, America and Japan. The Hankyu Department Store, Osaka, Japan invited Kaffe to create three room sets in their store for a British Fair, sponsored by the British Council. 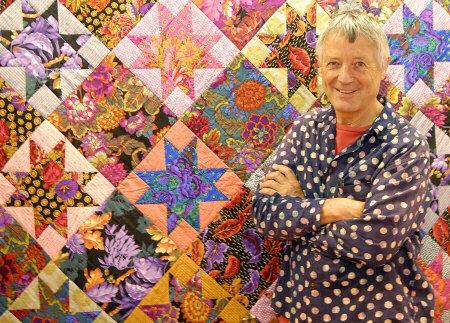 In June 1998, Kaffe displayed his quilts from his book Patchwork at the Japan World Quilt Fair in Tokyo. 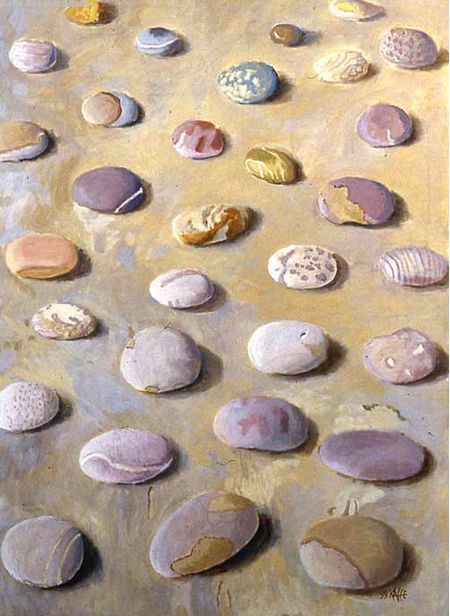 In December 1997, for the first time in 20 years, an exhibition of Kaffe’s paintings was shown at the Catto Gallery, London followed by another show in 1999. Kaffe’s first needlepoint design was commissioned by Pamela Lady Harlech for Lord Harlech. Since then, commissions include: two five-foot square needlepoint tapestry designs for Marks & Spencer’s Christmas packaging; tufted rug designs for Christopher Farr Hand Made Rugs; two five-foot square needlepoint tapestries for the Sea Princess cruise liner; a needlepoint tapestry for an Elizabethan house in Yorkshire; a series of five tapestries and a tufted rug for The Edinburgh Tapestry Weaving Company; a 13′ by 15′ mosaic mural at the entrance to a theatre in Ojai, California; needlepoint arm chairs for clients around the world and an endless list of one-of-a-kind design garments. 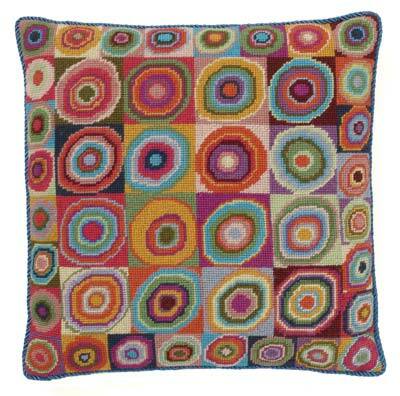 Since 1981, Kaffe has worked closely with Rowan Yarns in Yorkshire. 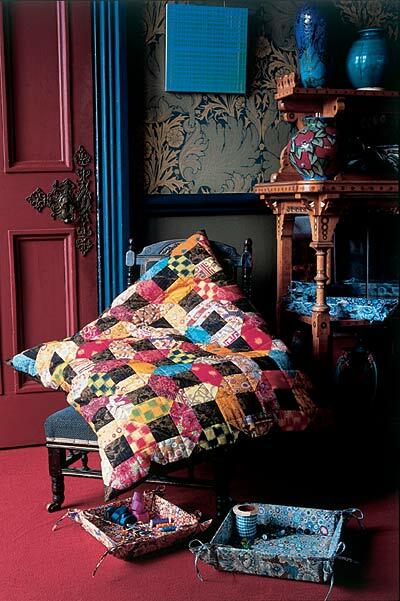 Since 1976 Kaffe has been the leading designer of needlepoint kits for Ehrman Tapestries of London, and has regularly designed collections of furnishing fabrics for Designers Guild. Oxfam asked Kaffe to work with weaving villagers in India and Guatemala and a range of striped fabrics is being produced for use as shirt fabric, bed throws and patchwork fabric, available on an international basis through Rowan UK and Westminster Fibres, USA. Other charity work has also taken him to South Africa. 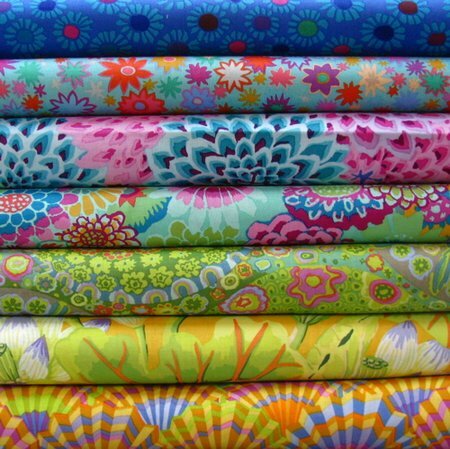 Kaffe designed a printed fabric range for patchwork with the Indian stripe fabric and shot cotton fabric range distributed world wide by Westminster Fibres, USA and Rowan, UK. 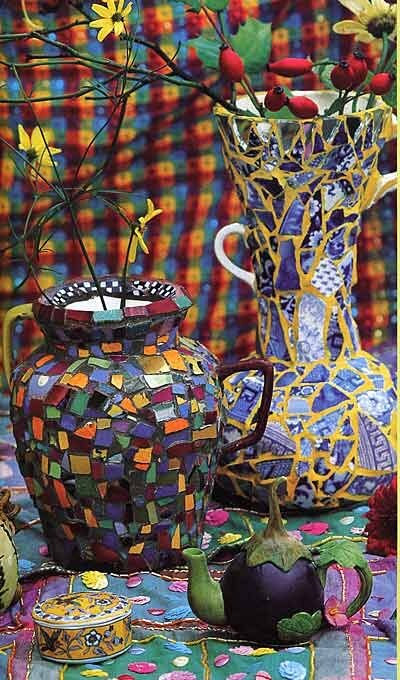 Kaffe Fassett Candace Bahouth’s Mosaics (Ebury Press), and Welcome Home Kaffe Fassett, part of Martingale USA At Home series were published in 1999. 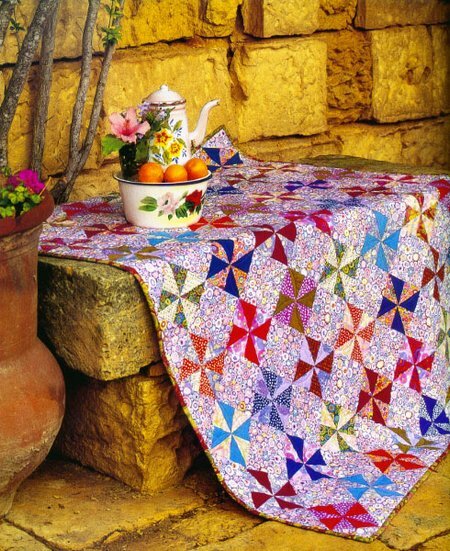 I like almost everything by Kaffe, I’ve learned so much in needlepoint from his books!